You should by now have your website at the stage where some unique content has been added to it. As soon as we finish doing some SEO with the website, we will be able to publish it and make it go live.We want the website to have the best possible opportunity of being found by the search engines. To achieve that we can do what is referred to as “optimise the website” for the benefit of the search engines. In simple terms this means we can do certain tweaks or adjustments to the website that help the robots sent out by the search engines to understand exactly what our website is all about. Now before I delve into the detail of this thee most important thing about your content is that you write it to suit their needs. Always write for your visitors first. The tweaks I will show you below are simply to tell the search engines what your articles and website is all about. How do Search Engines Gather Content? The reality is that millions of content is added to the Internet every single day. It would be impossible to analyse that, rate it and rank it by human intervention. That is why Google and other search engines use robotic software to gather and collect this information. That information is then sent to a huge database where it is properly analysed and has certain criteria applied to it. For example if I write an article about “which coffee grinder is the best for making espresso” Google can find that article on my website and compare it to every other article related to that set of keywords. So when people talk about optimising a website, they actually mean optimising each article on the website. In simpler terms Google ranks each page or post rather than rank a website. So if we can help the robot to understand what each of our articles is about, then we stand a much better chance of getting each article ranked. That can be done in a number of ways so let’s look at those individually. An internal link is simply a link from one article of your website to another article on your website. The reason this helps a lot is because the search engines like websites where visitors visit other pages/posts on your website, and spend a long time on your website. By including links from articles on your website to other relevant articles gives visitors the opportunity to do that. As long as the links are relevant this works very well. 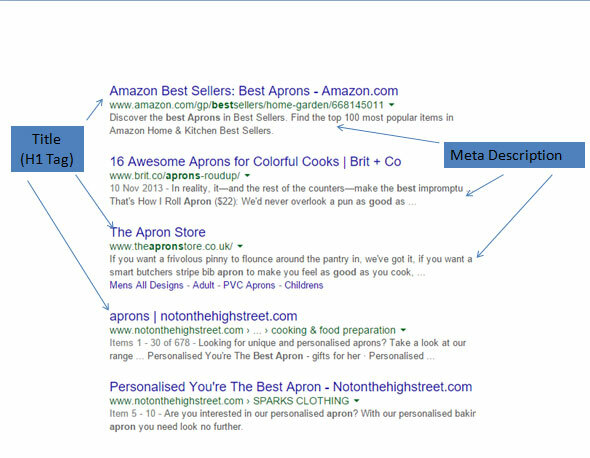 Likewise the use of categories on your sidebar and your menu also create a good internal linking structure. Always link internally as and when you have the opportunity to do so. So if in an article I was writing about a hand grinder, then linking to all informational style posts about hand grinders would be a good idea. All good websites will have a solid internal linking structure. As long as the internal links are all relevant this method works really well. Avoid linking to non-relevant categories within your website. 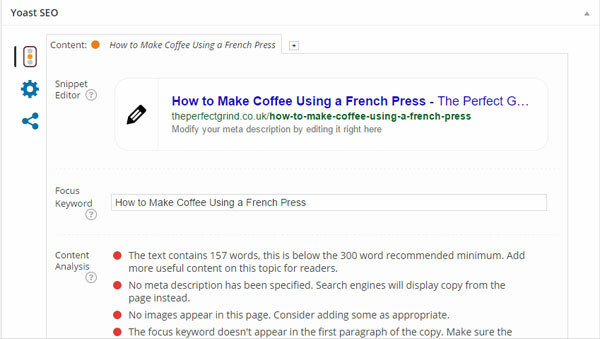 For example if I am writing about making a cappuccino then providing an internal link to a French Press is not of any value to a visitor and it is not relevant to the search engines either. All search engines have an expectation that there will be some external links on your website. It does sound like the wrong thing to do as in essence you are sending people away from your website. Many Affiliate Marketers really struggle with this idea and just leave them out. That is a mistake in my opinion as the search engines like to see and search a natural looking website. So with my website for example, an external link to a brand name that sells coffee pots would seem to be both a relevant link and a natural link. So if I am writing a review on a Hario burr grinder, an external link to the Hario website would be a very natural thing to include. I normally include one external link in all of my articles and in some cases more. Just make sure that when setting that link that you open it in a new tab. That way if a visitor does click on it, their browser will open that website in a new tab, but still keep your website open as well until the close it. It is hard sometimes to understand that you spend a lot of time writing content to get visitors to your website and then put on links that take them away. I know a lot of Internet Marketers who just will not do this. No-one knows for sure if Google uses this information. In my own experience I have found that by adding 1 or 2 links my websites tend to rank better. The final decision is yours. When you add any image to your website you should do the following three things. Make sure the “Alt Text” contains the main keyword. I have shown an example below of an optimised image. Robots can not read pictures or images so they simply read the title and the “Alt Text” to allow them to understand what the image is. By including a title and this alternative text we can help make it clear to the robots what our article is about. More importantly though images can not be seen by visually impaired people and by providing an “Alt Text” you can inform these readers what your image is about. So for both usability and SEO it is always good to add both title and alt text to your images. So when you write an article it needs to have a Title. That Title is also your H1 tag or header tag. The search engine robots read that as a key indicator as to what your article is about. When writing your articles it is most likely that you will create sub-headings within your content. As standard, WordPress writes in what is called paragraph mode in the main content area. If you want something to show up as a sub-heading you can click on the sub-heading and then pick a header such as a H2 or a H3 heading style. These H2 & H3 tags also help inform the robots about the important words on your article. So in a typical article on your website the Title will always be your H1 tag and you should only ever have one of those. Your sub-headings can then be a mixture of H2 and H3 tags. There are more tags such as H4, H5 and H6 that can be used if you wish. I typed in “What is the best apron?” This shows the top 5 results that Google has returned for this search. In the blue colour you will see the Title. Underneath that you will see in green the full URL of the website page. Then underneath that in black you will find the description of the page or post. If you look closely at these it becomes clear that Google is partly judging those results by relevance to the actual search term. They can see that these elements (title and description) contain the words best and apron. The lesson to be learned here is to make sure your article has the keyword in the Title and also in the description. That helps tell the search engines what your article is about. You do have to also balance this with making your Title and description interesting to get visitors to click through to the article on your website. We review the best aprons and some of the best aprons are made from cotton. These best apons really are the best aprons available because they are great. What Is The Best Apron Available in the UK Market? We have reviewed a range of aprons made from the best quality materials and then rated them to find out which is the most popular. Click here to read more. We have created a well optimised article title and description and also one that visitors would find more interesting. I had advised you to install a plugin on your website called Yoast SEO and this is what we should use to create our titles and descriptions. Underneath each post and page that you have created you will find the Yoast settings for each page. You simply click “Edit” on each post or page and scroll down to underneath the article. You should find a box that looks like the image above. Look at the Snippet editor and if you did nothing to this article that is what it would look like on the search engines. It is not optimised and looks rather ugly. You will notice what happens here is that the plugin simply grabs the Title you typed in and adds the name of your website to it. Also notice that the name of my website is clipped. That is because Google will only show 50-60 characters and then cut it off. Below that the plugin owner also offers some other information and analyses your page. I ignore this as it is the opinion of the plugin owner as to what good SEO looks like. I simply focus on creating a good title and description. To change that you can click on a small pencil icon at the end of the title and over write what is there. If you use too many characters it will turn red and you will have to make it shorter. The same applies with writing your description though you get around 160 characters to do that. I have changed mine to this. As you can see I am trying to get the most out of my Title and description. It tells the search engines what the article is about and is also inviting enough to encourage visitors to click on my article and read more. When you are happy with both the title and description then click the UPDATE button on the post or page to make the changes take effect. I would now go through my posts and pages and make the changes so as you have a great set of title and descriptions for all of your articles in your posts and pages. What Makes A Well Optimised Article? Your content will always be the main thing that stands out. It needs to be unique, well written and authentic. It needs to add value to the visitor’s search and answer their question. Any images and videos that you add should also add value to their visit. If visitors don’t like what you have there, they hit the back button and will not come back. Avoid that at all costs. Your content and navigation should be easy to understand for visitors. Your website design should also look polished and professional. Visitors tend to initially scan a page before they decide to read it. On your website is that easy for them to do, and will they find the key information they are looking for? Does the page load quickly? Does it look good on all devices such as a laptop, tablet or phone? Does the URL make sense and is it unique? Try to keep the actual URL short. When you write the title of an article in WordPress and then start to add content, the title you selected also becomes the URL of the article. For example in this article http://theperfectgrind.co.uk/e-prance-manual-coffee-mill-review/: You can see that the URL has simply taken the title of the article. The URL is the website name followed by a forward slash and then the title of the article. For this article that looks ok.
That makes it easy for the search engine robots to find and to understand. To edit a URL is pretty simple. When you add your post or page the first thing that you will do is to add your title. You can then click save as draft, or simply click on the content area. 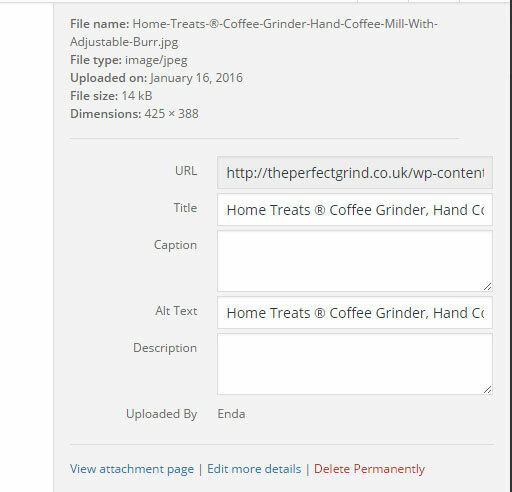 WordPress will then convert that title to the URL. If you want to change the URL, you then click on the edit button as shown below. As well as changing the URL if appropriate you should also check and see if your visitors can find an article in about 2-3 clicks easily? Also make sure that the Title is optimised and the description is optimised? Does the article target a single search intent or relevant intent? Do you have social links where visitors can share your article? (I will cover this later) Are visitors likely to share your article with others? This article is about doing your best to optimise your website/blog for both visitors and especially for the search engines. Internal and external linking is a very good idea as long as it is relevant to your articles. Optimising your images is also a very good idea so make sure to change the file name of the image to include your keyword. Then make sure the title and the description also include your keywords and related keywords. Change your Meta description using Yoast SEO plugin to write a relevant description. The most important thing on your website will always be your content. By making a few adjustments and optimising your page, you help the search engine robots better understand what your website is all about.